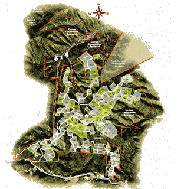 Creston’s mountain property is the perfect marriage of quiet seclusion and everyday convenience. Our gated mountain community is a place for people who like their privacy but want the opportunity to get to know their neighbors…perhaps while walking one of the trails that meander through the Creston reserve, pausing at one of the overlooks, or relaxing at sunset around the fireplace at the lodge. But it's also a place for those who want to stay connected to the world, from cable television and high-speed internet connections to easy access to the vitality and variety of Asheville, Black Mountain and Chimney Rock. The entrance to our mountain property greets you with the timeless spirit of the mountains; an artesian water grotto, followed by a dry stacked stone wall leading to a handcrafted gate. 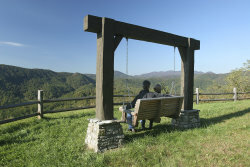 Continue to the first overlook to view Crooked Creek Valley and the majestic Hickory Nut Mountains. Up the road past beautiful hideaway homesites is the Creston roundabout and fire pit, where quiet avenues radiate out, each leading to a secluded cul-de-sac. One road will lead you to Triple Falls Sanctuary, another to the Community Center on the summit of the mountain. All gentle and natural with dramatic views of the surrounding mountains.